This competition has been concluded. Please look forward to the results! Try your hand at a new variation of Sudoku entitled "Wordoku"! In Wordoku, puzzle solvers use letters instead of numbers to complete a Sudoku-like grid. 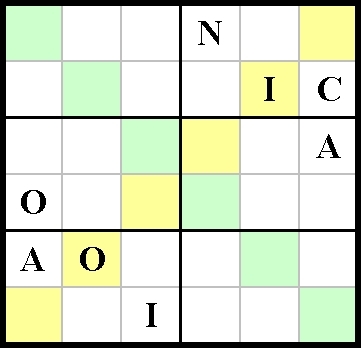 Upon completion of the puzzle, the upper-left to bottom-right diagonal will read out the name of a common everyday English word. Full details provided below! Instructions: "Fill in the grid so that every row, every column, every six-square subsection, and every six-square diagonal contain all of the letters in the phrase "AS COIN" (that is, A, C, I, N, O, and S). 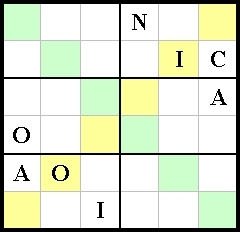 When you are done, the top-left to bottom-right (green) diagonal will read out a common everyday word related to both the phrase above and to one of the articles in this month's edition of Gaardian. Using your deductive reasoning abilities, you should be able to make short work of this month's mini-challenger." There is only one solution to each puzzle. For more information on the original puzzle, visit http://www.sudoku.com/.